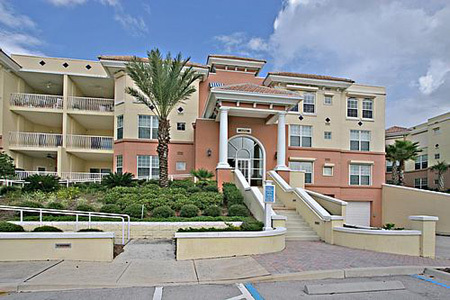 Ocean Villas condominium at Serenata Beach, Florida. Ocean Villas at Serenata Beach is a luxury oceanfront villa with Mediterranean style architecture and concrete block construction. Located in Ponte Vedra Beach, Ocean Villas offers oceanfront living with panoramic view of the Atlantic Ocean and Intracoastal waterway. This gated community features 3-story buildings with 22' oceanfront terrace, balcony with sunset views, elevators serving two residences per floor, enclosed garage parking with storage room, private beach access, and a lifetime family membership to Serenata Beach Club. Enjoy the beach lifestyle of fun, sun, ocean breezes, and the sound of crashing waves. Ponte Vedra Beach offers the best of Florida living with miles of white sandy beaches and mild seasonal changes. Three expressways provide easy access to Jacksonville for business, shopping and entertainment. Friendly, laid-back lifestyle where standard attire is shorts, sandals and a smile. Semi-tropical climate with breezy summers, pleasant winters, perfect springs and falls.